When my school library received this book, I was ecstatic! I teach the film class at my school and the graphic novel class, so for me to like this book was a no-brainer. And it makes soooo much sense to teach film through the graphic medium. Images, man…images! It’s what it looks like: a graphic novel that works as a film study text book. It’s not about making films; it’s about thematically analyzing them through many different lenses including The Body; Sets And Architecture; Time; Voice And Language; Power And Ideology; etc. This book is rich with research and anyone interested in learning more about film while reading this book will find hundreds of avenues to travel on their film knowledge quest. If you are a film buff, buy this book because checking it out of a library will not be enough; you will use this book as a constant reference. I don’t know if my school library will be getting it back from me! EK: One thing I always like to ask fellow comic/graphic novel fans…what is your intro to comics story? How did you get into the medium? Family? Friends? Was it random? ER: My first exposure to comics was from my older brother’s extensive collection of The Beano – which is a very popular kids comic in the UK. He had copies and annuals from throughout the 1980s so I got my start reading them. I grew up reading Calvin & Hobbes and Peanuts, and would draw my own comics throughout my primary school years (that’s ages 5 – 11). I left most comics behind in High School, but my partner who I met when I was 16 reintroduced me to comics and showed me the wider variety that I had no idea existed. She really sparked the interest for me again, and around that age I started drawing comics again. At that stage I was getting into Dan Clowes and stuff like Preacher and Transmetropolitan, and since then my tastes have broadened even further. 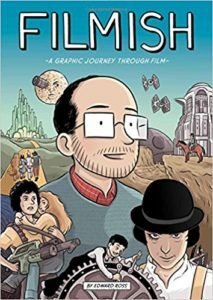 EK: Why a graphic novel to pass along the information about film? ER: It just felt natural to unite my dual loves of comics and film together. I was drawing comics very occasionally in university (studying film) and when I graduated I wanted to continue reading about film, and Filmish seemed like a perfect way to do that. In retrospect it turns out it was a good decision – not only was it a novel way to talk about film that allowed me to draw attention to my work, but it also proved a quite successful way to investigate film. I think me drawing these cartoony representations of films allows the reader to step away from the film a little and look at it with fresh eyes – that’s always been my intention, to bring readers new ways to look at film, so it’s sort of perfect. EK: If you had an extra six months to add/subtract/edit something from the book, what would it be and why? ER: Two things I might have pursued – one would be to make the comic in colour, though it was always intended in black and white. Secondly, and maybe more importantly, I think another six months would have just given me the breathing room to think more about what I was including. I keep on remembering amazing films I could have featured in the book, and feel guilty I left them out. The book’s not meant to be encyclopaedic but it’s a shame to have missed out some great examples of the things I’m talking about. If you enjoy film and comics as much as me and Edward Ross, go buy this book! It’s very cool! I’d like to thank Edward Ross for his time. I look forward to his future projects and seeing the other cool things that Self Made Hero puts out.